"A comedy of Galactic Proportions." Galaxy Quest is a movie about a group of actors who once starred on a television show of the same name. In the show, they worked aboard a spaceship called the NSEA Protector. Taking place seventeen years after the last episode of the show aired, it remains popular among fans and the actors find themselves traveling to conventions for appearances and to sign autographs. Jason Nesmith, known as the commander Peter Quincy Taggert, greatly enjoys his life before overhearing a conversation that reveals to him that he is a joke to much of the public. Shortly after, he is approached by what he believes to be a group of fans. These people turn out to be a race of aliens known as Thermians who live their lives based on the Galaxy Quest show. The actors go along with the Thermians, believing they are heading to a paying gig. They soon discover that the Thermians, NSEA Protector, and the threat to both are all very real. They must take on the very same roles they played for years if they want to save the Thermians and find their way back home. 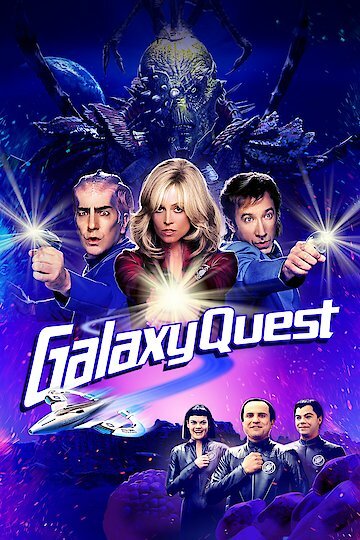 Galaxy Quest is currently available to watch and stream, buy on demand at Amazon, Vudu, Google Play, FandangoNow, iTunes, YouTube VOD online.